Like many Democratic candidates for Michigan governor, frontrunner Gretchen Whitmer has made college affordability a centerpiece of her campaign. 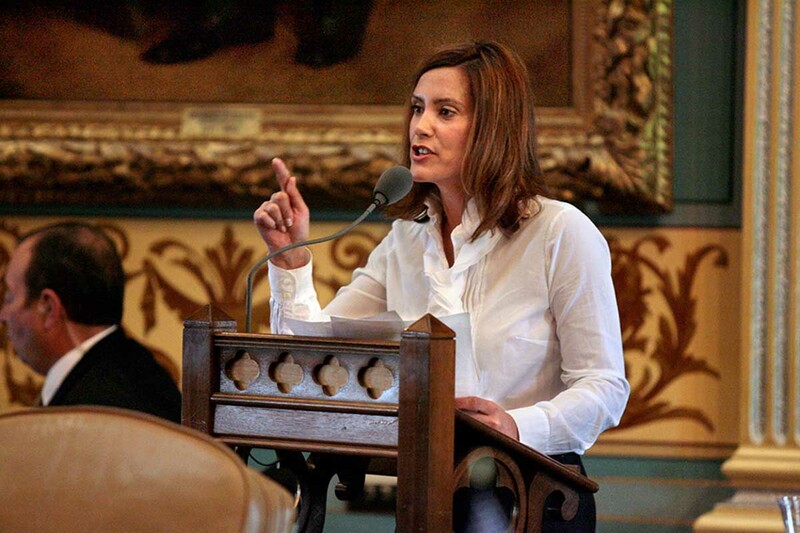 In a tweet in late January, Whitmer wrote, “Our state used to pay 75% of your college costs, today it’s about 25%.” She called for higher education and skilled trades training to be made more affordable for Michigan families. Depending on interpretation, “college costs” could refer to the amount of state taxpayer money spent by colleges and universities, or to the amount of money individual students (and their families) pay to go to college. We find Whitmer’s claim is mostly accurate. Each of Michigan’s 15 public universities draw from their own “general fund,” which is used for instruction and related activities, according to the state’s House Fiscal Agency. That doesn’t include any “auxiliary” costs or revenue, such as dormitories, hospitals or research grants. According to data from the state’s House Fiscal Agency, since 1977 the state has paid at most 65.6 percent of the general fund revenue for Michigan’s public universities. That was in 1979. That percentage has dropped over time. According to the most recently available data, from fiscal year 2017, state appropriations make up 20.9 percent of public colleges’ and universities’ general fund. As the amount of money in higher education coming from the state has dwindled, the amount coming from tuition has grown. In 1979, the year when the state was contributing the most to higher education general funds, tuition and fees were 28.4 percent of higher education general fund revenue. Now, they comprise 71.1 percent of it. So it’s fair to say that as state funding for higher education has declined, the tuition amount that students and their families have borne is a larger burden of the costs. Also, state scholarship funding has been cut in half in the last 10 years, according to data from the Michigan Department of the Treasury. In 1975, the maximum Pell grant was large enough to cover tuition at public colleges, while now it is worth less than half of Michigan’s public university tuition costs, as MLive reported in September. Annie Ellison, communications director for the Whitmer campaign, told Truth Squad the candidate was drawing from a 2015 Washington Post article using national higher education funding data and a 2012 Bridge Magazine article referencing Michigan data. After receiving Truth Squad’s inquiry, Ellison passed on similar statistics — a high point of the state covering around 70 percent of higher education funding, with around 30 percent paid for by students through tuition. “If we had to do it again we’d have been clearer that we were talking broadly about college nationwide and that we meant covering total cost, rather than tuition specifically,” Ellison told Truth Squad. Michigan used to shoulder a significantly larger burden of the cost of the state’s public colleges and universities. Research indicates a link between a reduction in state funding and an increase in tuition: One national study estimated that every $1,000 per student funding cut leads to typical student to pay $257 more in tuition and fees each year. states population is likely to decline quite a bit. Part of the issue relates to the fact that a higher percentage of people in the US go to college today, compared to thirty or forty years ago. I am not sure that there is much difference in total dollars (adjusted for inflation) spent by states, including Michigan, for colleges and universities, but more people are attending college, and therefore the dollars are spread out among a larger number of people. The result is a lower percentage of state support per student. This was true for me. The state paid a lot more in the past. Two problems with this premise. First, "Michigan Promise". Does anyone remember how that budget line item spectacularly crashed and burned? Second, has anyone stopped to think about having a reliably increasing source of income being a major factor in colleges pricing themselves out of the market of their customers? Where is the incentive of reining in your costs when you can expect a steady source of income? While giving away free stuff will definitely play a part in the upcoming gubernatorial campaign, the question shouldn't be how accurate Ms. Whitmer's statements are, but rather can she find a way to pay for them? Public funding for higher education is a very sticky wicket, and is probably far too complex for us to expect to be adequately addressed in a race for the governorship. Yes, at this point, I'm inclined to support Gretchen Whitmer, but not because I expect her to become a beacon of hope for folks who are presently addressing the costs of sending their children to college. Educational institutions are not different from any other institution that fancies itself to be indispensable. I was once a candidate in 1960 for a PhD in Renaissance Intellectual History, but I dropped-out for two compelling reasons. One, it was simply far too socially isolating. And two: college professors simply were not paid enough to make the work attractive. Professorial compensation subsequently got better, but in the longer term, it can not be sustained. Why not? Because since about 1980, the basics of the world economy have shifted drastically, and has deeply undercut the ability of middle American taxpayers to sustain such an educational system. Firstly, in order to sustain their established standard of living, nearly all wives went to work. Then, they worked more and more hours and jobs. Then they borrowed against their "home equity". And finally, they posted more and more credit card and student loan indebtedness. There is no longer any other way-out. These are the mass of taxpayers who would be expected to shell-out more and more of their declining real income. It just ain't gonna happen! Until all of the folks who are employed by educational institutions face-up to these immutable economic facts, there is no way to improve this situation. So is Jennifer Whitmer saying we need to cut spending somewhere else to subsidize college students? Where? Or is she saying we need to make someone else pay more? Who? The problem with politicians. 55 years ago when I was in college I paid less than 1500 ayear for room, board, books and tuition. I earned $4.00 an hour on construction. After 7 years of college and part time work I owed $1000 dollars. Those days are gone forever. Even at $10 an hour all summer you can only earn $4000 minus deductions. Try a four year college for under $20,000 a year. Debt is over one trillion for loans. R.L.